Strawberry beds start slowly, hit peak production and then decline fairly quickly over a few seasons. The slow start comes when beds are planted in the spring- a few berries are produced but it is recommended to pinch off most blossoms so more energy goes towards getting the plants established for the next year. The 2nd and 3rd years’ production is high as the plants produce and send out runners creating more plants. From here, the bed chokes itself out and production is limited due to competition and disease issues brought on by the overpopulated bed. This is a somewhat simplified explanation but pretty much sums up how it works…. First, the remaining plants do much better. 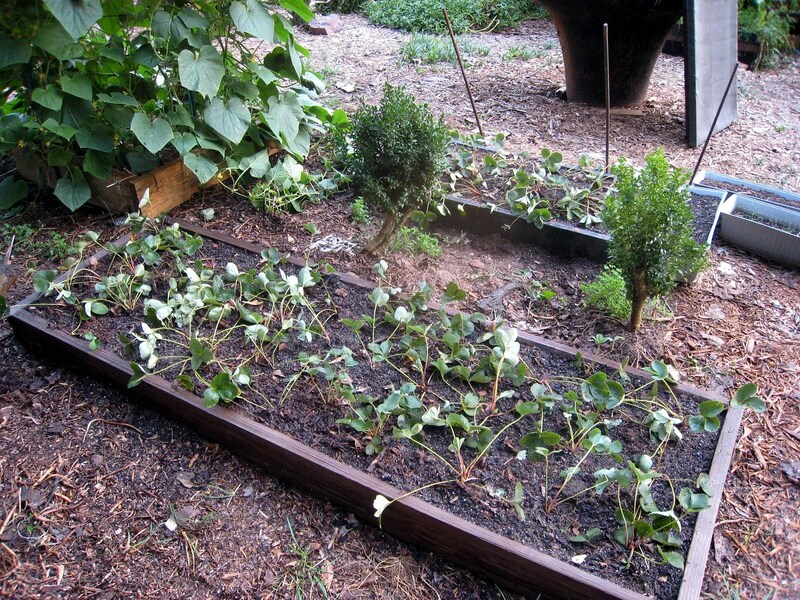 Second, you can easily replant the pulled runner plants in new beds in late summer/fall to start the cycle over. Third, and most important to cheap arsed er… I mean “frugal” gardeners, is you get new plants for free. In the spring strawberry plants can run a couple bucks each. My original plants were “only” about a dollar a piece, a very good deal at the time, but that was still $50. Ouch. 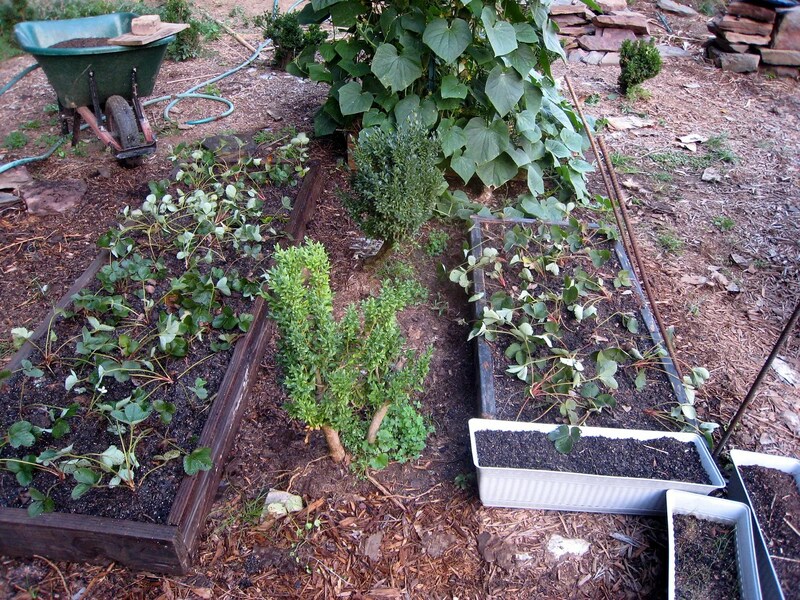 So that’s what I got done last week – two new strawberry beds with about 40 new transplants in them. I have time (and plenty of runners yet to thin in the original bed) to set up another bed or two. Note: The rebar is leaning over the beds to support the two shade panels you can see against the bell. relief from the late afternoon sun seems to help. Also the two american boxwoods between the beds are going to be relocated this winter. ← Chillin with the cicada killers…. Great looking beds. My parents’ old garage used to sprout strawberries every summer for the first few years we lived there. The former owners must have planted them. Great post, Wish we would have thinned out our bed before it choked itself out. Yes, but what you lack in strawberries you have more than made up in peppers. I didn’t know this about strawberries- thank you!